Whether or not you care for it, Treasure’s most notable shoot ‘em up, Ikaruga, is heralded as a transcendent force in the genre. Its development began as one man’s labour of love and its mechanics went on to inspire a decade of more puzzle-oriented interpretations of a traditionally action-filled genre. Later impressive games such as eXceed 2nd would use the polarity switching concept Ikaruga helped popularise, which let players change colours at will to absorb bullets. Coming from Spanish studio Artax Games, Iro Hero is not ashamed of its inspiration either and confidently boasts the same polarity switching mechanic. Playing Iro Hero, it’s clear that the developers did not want to emulate Ikaruga’s strengths despite their reverence but spin them off into something distinctive. Its pixel art aesthetics and riveting soundtrack work well towards that end. I just wish the game had spent a little longer in the oven. Iro Hero impressed me before I even hit the start button. For starters, the name Iro Hero is one of striking utility. Iro is the name of the game’s protagonist, “iro” is also Japanese for colour (alluding to the colour-swapping gameplay mechanic), and it all rhymes nicely. The title screen is handy in that it features the game's controls, high scores, and point values for each enemy. This is inconsequential in the grand scheme of things, sure, but consider how many games rely on needlessly verbose tutorials or assume you’ll figure out the controls yourself. Iro Hero grants access to a wealth of information without foisting any on you. Iro Hero takes place approximately 300 years in the future. 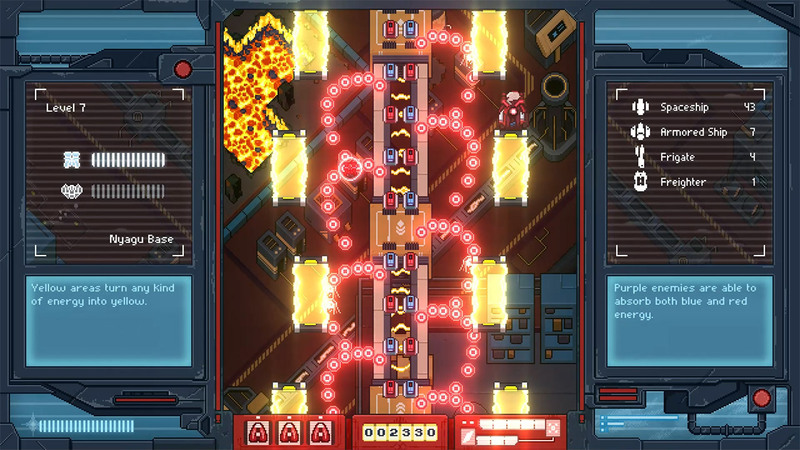 The game’s plot deals with the consequences of a benevolent alien teaching humans how to harness electricity from within. This leads to prosperity for a time, but humans begin to exploit one another for resources until less compassionate aliens escalate it by doing the same. The protagonist, Iro, sets out on a journey for the sake of his mother in a human farm. 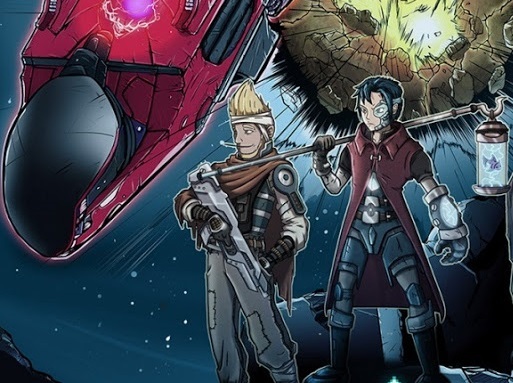 It’s not as outwardly philosophical or as contemplative about its politics as Sine Mora, but it definitely applies a more concerted effort towards telling a story between and during levels than most shoot ‘em ups. My gripe is not with the story itself but how it is told. In the aforementioned Sine Mora, gameplay would sometimes stop so conversations could play out, giving players time to indulge the story or concentrate on action set pieces. Not everyone cared for the action screeching to a halt, but there’s no denying it let the plot flow. I can appreciate that the developers of a retro-style game might not have wanted to do voice acting, but the original Star Fox boasted large, legible text positioned so you could read character banter at a glance without being overly distracted from gameplay. Iro Hero instead divides your attention between the left side, center, and the right side of the screen, forcing you to pick between plot details and staying alive. That choice wouldn’t even be the end of the world if Iro Hero’s difficulty was more forgiving, but I’ll get into that shortly. As we’ve established, Iro Hero’s design hinges on the polarity switching concept. 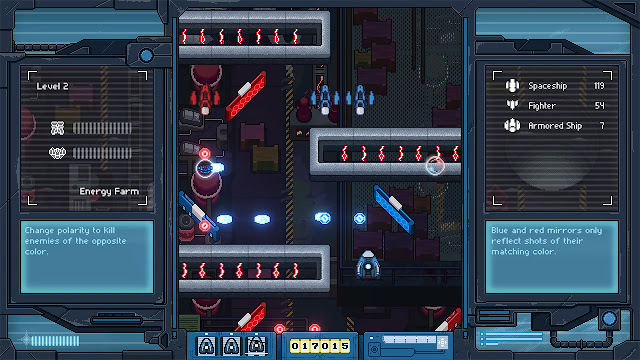 This opens up opportunities for obstacles such as force fields that reject ships of the opposite colour, panels that reflect the appropriate bullet colours, and bosses with alternating minions. As in similar games, swapping colours enables you to absorb enemy fire and become invulnerable to enemies of the same tone. There’s a twist, though; the game features four colours and not all of them are accessible through the same means. With the greater volume of polarities comes level designs that can theoretically be more puzzling and dynamic than Ikaruga. The flipside is that Iro Hero loses some of the traditional strategy by relying on that concept above all else. Most of the game’s puzzle solving until is about knowing when to flip a binary switch. Later levels do indeed introduce fresh mechanics, but the implementation means it does not feel like an extension of the player’s arsenal. The tardy waves of enemies as the game introduces you to its mechanics throughout the nine levels can make several feel long in the tooth. When it comes to power-ups, most are irrelevant. They can expire naturally and one hit means they’re history anyway. Boss fights feel a bit sloppy and more than slightly exploitable. I reckon many players will be able to see through them within seconds and they don’t put up much of a fight until much later. A combo system is also implemented, but it doesn’t feel as effective as it could be for reasons I’ll soon tackle. High scores stem from defeating enemies consecutively and grabbing a moving bubble full of points at the end. The reward for a high score is being able to revive on or two of your three available ships upon the completion of a stage. The game also tries to encourage contemplation in regards to how you dispel common opponents. When deciding which coloured forces to attack, you’re supposed to weigh the value of points, surviving, building up a super attack, and various other factors. In practice, it’s often more about memorisation than quick thinking. Generally speaking, enemy placement is just not as well considered as Ikaruga. That game would often invoke techniques such as foreshadowing the appearance of foes through minor background details. Getting hit by bullets is probably the least of your worries in Iro Hero. 75 per cent of the difficulty is not derived from the bullet patterns or the puzzle gameplay but the simple fact that collisions with other ships results in instantaneous death. Perhaps in fear that the player could just absorb enemy bullets all day, levels are teeming with enemies that home onto your ship (regardless of colour) and vehicles that sneakily veer in from off screen, resulting in a game that once again compromises problem solving. If Touhou games are bullet hells, Iro Hero is an enemy placement hell. 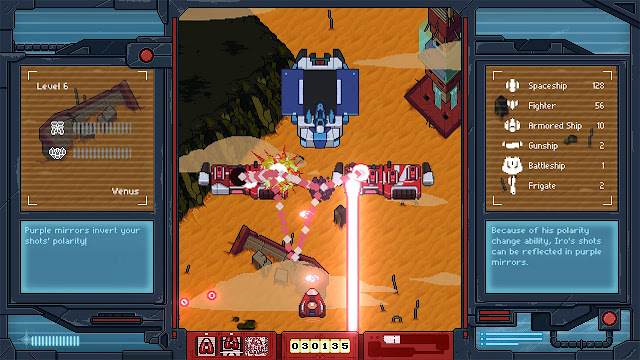 Some of the hardest shoot 'em ups I've played are easier, not only because of Iro Hero's level design but its unyielding arcade philosophy in 2018. Iro Hero is also starved for the polish present in some of the world’s finest shoot ‘em ups. The act of polarity switching, this game’s central mechanic, feels less reliable than it should. Holding down a button to change your color causes it to toggle continuously. It sounds minor, but in tight situations, holding slightly too long can be costly. Similarly, the lack of more accurate D-Pad controls for fine-tuned twitches instead of just the control stick seriously impacts a game about precision. The lack of a TATE mode (vertical full screen) inhibits the ability to see the game’s field of version properly. This absence is glaring since not only is the Switch’s design tailor made for this, but developers of all sizes on the eShop have been including it (including this game’s own inspiration, Ikaruga). Lastly, the art style seems oddly inconsistent between cutscenes and in-battle conversations for no apparent narrative or artistic effect. 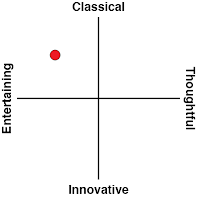 There’s not much in the way of modes, which this game in particular could have capitalized on brilliantly. There is a practice mode, but it couldn’t be more useless since you can only play stages you've already cleared. Instead of providing authentic options such as score attack, the game insists you play arcade according to its rigid laws. When you force players to adapt, it makes all the level design shortcomings all the more prevalent. You'll be replaying the blander levels before the game starts to hit its stride and becomes authentically creative. Unlike an arcade game, though, you obviously can't slot extra credits into the machine. You'll need to be the patient type who enjoys replaying the longwinded levels one through six dozens of times so you can start learning how to beat seven. Challenging games are still plenty marketable these days given the right context, but having to repeat all of your progress from scratch (particularly in a game with more, longer stages than the average arcade shooter) is fairly archaic. If a game does this, it usually offers some kind of compromise like an easy mode (most games), unlockable continues (Ether Vapor Remaster), or alternate paths with different skill parameters (Super Hydorah). The level design itself might offer strategic power ups, cleverly placed extra lives, or weapon types to tackle a situation differently. Some crutch, anything to cling to until your skills ascend to such a level that you can conquer the "peak" of the mountain without a harness. To see what others thought of Iro Hero’s difficulty, I hit up the online leaderboards. While the game only has a sample size of about 220 players as of this writing, I observed that simply beating level one snagged me a spot in the global top 10. Said score wasn’t even good enough to beat the preprogrammed offline ones on the main menu. This suggests that A) 210 in 220 people can’t get past level one or don’t grasp the basic mechanics of the game or, far more likely, B) few people about the risk/reward high scoring mechanic because they’re spending every point to hang on for dear life. 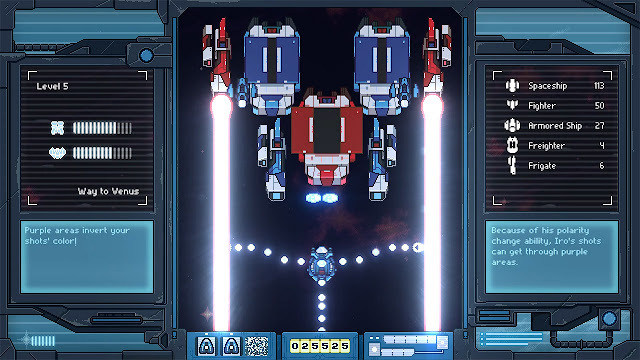 I believe that shoot ‘em ups are worth mastering and replaying for high scores, allowing players to spend hours achieving a meditative trance. Due to its pacing and level design, though, Iro Hero is not the first, second, or tenth game on my list that I would choose to invest that time in. If a modern game is going to invoke this type of difficulty, it has a lot to prove. Using score as a bargaining chip devalues the achievements of those who complete the game. 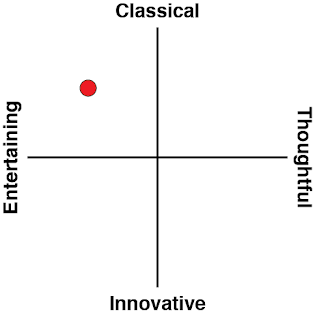 Despite my harsh criticisms, Iro Hero is not by any means without merit. The rocking soundtrack in particular is part of what made me soldier on through some of the more frustrating level layouts. The deeper you get into Iro Hero, the better it gets…which is why it’s disappointing to think that many may not even bother. Because the nine long levels in Iro Hero are dictated by a sluggishly scrolling camera, repeating them doesn’t pack the same high-octane punch as most Japanese shoot ‘em up greats. Iro Hero ambitiously seeks to reinterpret polarity switching shooters. Baffling design choices render it alienating even to seasoned shoot ‘em up fans, however. The blueprint for a clever shooter is here and it’s possible the developers will rectify that base game with patches and updates, but the Iro Hero of today does not reflect that lofty potential.